Environmental DNA (eDNA) methods (the isolation and identification of species’ DNA from an environmental sample) are increasingly used as a monitoring tool for aquatic and even terrestrial amphibians and reptiles. This webinar will provide an overview of eDNA methods and its applicability toward monitoring amphibian and reptile populations. Topics will include a brief overview of the development of eDNA for herpetological monitoring, field collection protocols, a discussion of genetic methods for both species-specific and community monitoring, and suggestions for how to implement eDNA into a monitoring program. This webinar is targeted toward personnel with limited first-hand experience with eDNA that are looking to learn more about the method or develop their own eDNA projects. Stephen Spear is the Director of Wildlife Ecology at the Wilds in Ohio. Prior to his current position, he was a conservation scientist at the Orianne Society from November 2009 through August 2016. He received his PhD from Washington State University in 2009, MS from Idaho State University in 2004, and BS degree from University of Richmond in 2001. His work focuses on the ecology and conservation of wildlife species, with a special emphasis on combining genetic techniques with field ecology. Currently he is working on a number of wildlife projects, including Eastern Hellbender conservation (including eDNA monitoring), American Burying Beetle reintroduction, amphibian distribution across disturbance gradients, and global viper conservation. 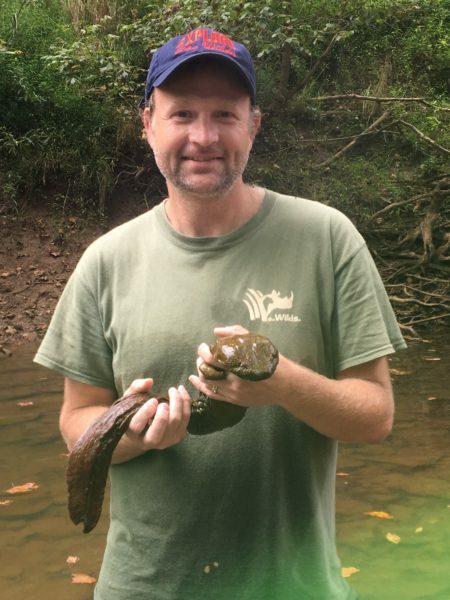 He has worked with eDNA monitoring of amphibians in both lotic and lentic systems since 2011, and continues to work on developing eDNA strategies to improve population monitoring, particularly with hellbenders. He has co-authored several papers describing studies of eDNA surveys and methodological development.